acquired by present owner, 1995. Asahi Camera, June 1969, within feature 'Accident 6'; Moriyama, Kariudo [Hunter], Chuokoron-sha, 1972; Phillips et al., Daido Moriyama: Stray Dog, San Francisco Museum of Modern Art, 1999, pl.62, no.103, titled 'Police Safety Poster'; Daido Moriyama 55, Phaidon, 2001, pp.44-45; Hunter of Light: Daido Moriyama 1965-2003, Shimane Art Museum/NHK Educational, 2003, p.110, pl.135, titled 'Crash'; Daido Moriyama: The Complete Works, Vol.1 1964-1973, Daiwa Radiator Factory, 2003, p.205, no.527. The prsent lot is one of only a few vintage prints made of this image. One known print is in the collection of the Tokyo Institute of Polytechnics. In 1969, the Warhol-inspired Accident series was published from January to December in 12 monthly issues of Asahi Camera. For this important series from the PROVOKE era, Moriyama liberally appropriated images of accidents from a wide range of sources, including tabloid newspapers, magazines and television. 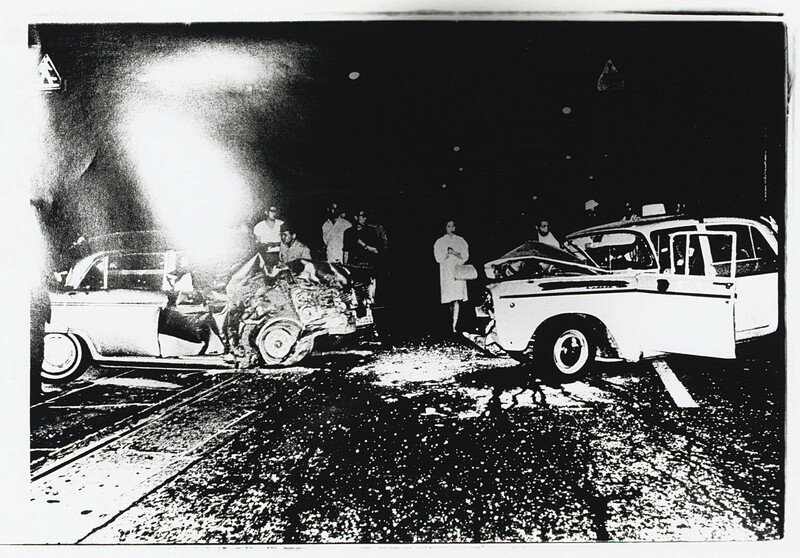 In the present lot, Moriyama re-photographs a photograph of a car crash reproduced on a police road-safety poster. Upon seeing this poster in a subway station, he was immediately captivated by the appropriated image. Alongside the image offered here, five vertical close-up shots of various parts of the original poster were published in the June 1969 issue (figs.1-2). Selected images from this series also appeared in both Farewell Photography (1972) and Hunter (1972). This photograph is the epitome of PROVOKE philosophy and aesthetic. The life and death contrast of people and objects -- exposed in this one photograph on a poster I happen to see -- made a great impact on me as something extremely accidental and strangely scandalous.